A very happy Christmas to my friends in Newham, Hackney, Leyton, Haringey, Brighton, Leamington Spa, Birmingham, Cardiff, Cornwall, Goa, Chiang Mai, Basle, New Orleans, New York - too many to name in person - and to everyone who took the time to read this blog during 2011. 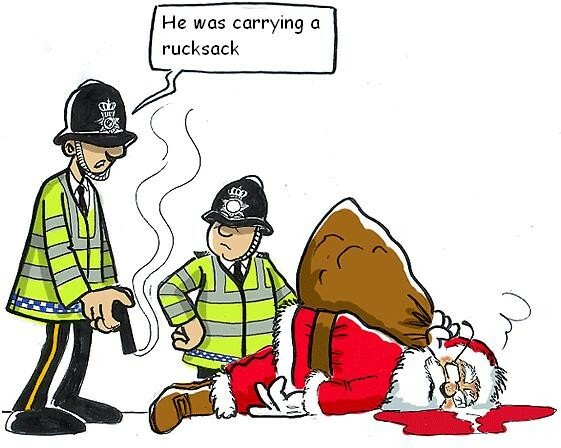 Next year, the area where I live will be crawling with armed police. It'll be our job to keep an eye on the buggers. As regular visitors to this blog will know, I have tried - without success - to find out how Newham council has spent its huge 'Preventing Violent Extremism' funding (see here, here and here). Trying to understand the notoriously opaque internal workings of the council is like the employing the guesswork of a 1970s Kreminologist - but occasionally it's possible to stumble upon a nugget of information. For instance, earlier this week I found out quite by accident that a consultancy firm called The Campaign Company is paid by the borough for "a project using values-based segmentation to understand why young Muslims radicalise as part of the PREVENT programme". It's the kind of detail that the council has refused to share, even though it can be found with a little digging on the consultants' website. However, the real reason I Googled them had nothing to do with Newham's shadowy 'Prevent' work, but a new contract that the Campaign Company has been given to undertake something called "Newham Resilience Research". Newham Council has commissioned research from The Campaign Company and the Royal Society of Arts to find more about the strength of communities and how they may be affected by the cuts in Newham. We want to understand more about the connections people have to both the individuals and organisations in their local area, in order to build stronger communities in which everyone can play their part. The Campaign Company is currently surveying the residents of Newham and to tie in with this, we would also like to get in touch with all community and faith groups affiliated with Newham. As organisations within Newham, you all play an integral role in community cohesion and resilience, and your thoughts and perspectives would therefore be very valuable for our work. We would really appreciate it if a representative or leader from your organisation or group could take some time to speak with us over the next week. Our interview should take no longer than 15 to 20 minutes. It all sounds terribly reassuring, but strangely enough, I didn't receive this e-mail directly. In fact, no-one working for the borough's various second-tier organisations, who have long-established relationships with the voluntary, community and faith sectors in Newham and a wealth of information about local communities and their diverse needs, appears to have been contacted either. I'm sure this is wasn't deliberate (cough) so why, I wonder, does Newham keep shelling out money on consultancies who have no idea that independent charitable groups in the borough have their own established networks and structures? Instead I found out about the research from a friend who is part of a local campaign group (one fiercely critical of the council) and who sent the e-mail with the words, "this looks unbelievably dodgy". I can see why she is so suspicious. One reason the council could be looking to map connections between individuals and organisations is because its 'Building Resilience' plans, if they ever get further than the drawing board, involve a staged withdrawal from the provision of more and more council services, apart from core support for the most vulnerable, leaving the majority of residents dependent on voluntary groups, informal networks and friends. 'Resilience' looks a lot like a rebranding of the government's massively discredited 'Big Society' proposals. Being Newham, of course, it's all rather chaotic and poorly executed. The Campaign Company say they are 'carefully' targeting only 60 groups but have been relying on a list of organisation contacts provided by the council in which 75% of the e-mail addresses are wrong. Furthermore, on the evidence of a brief conversation with them, they don't appear to have much of an idea of the geography of their target wards or who are the useful contacts within them. Sadly, I can't imagine the results of the research will adequately reflect Newham's voluntary, community and faith sectors in any meaningful way. Why, I'm left wondering for the umpteenth time, does Newham council keep shelling out money on consultants with so little actual knowledge of the borough? 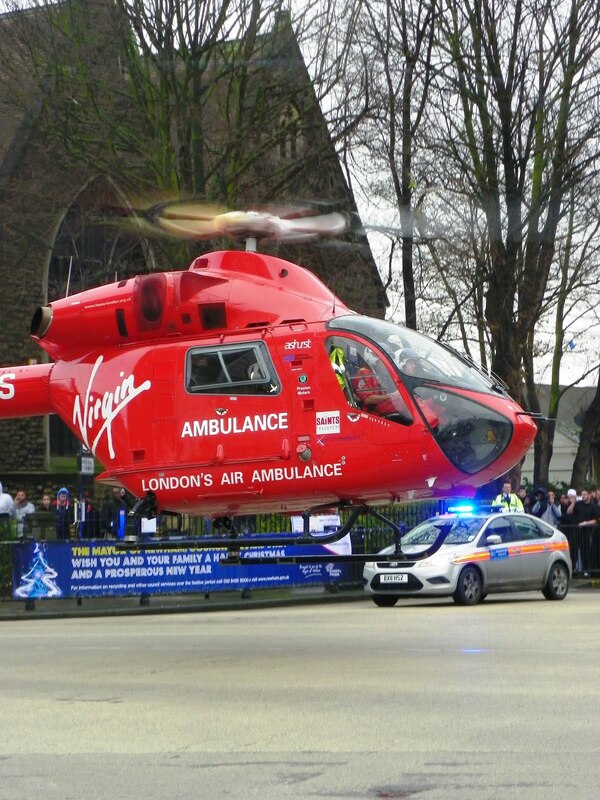 Yes, that really is my photo on the Newham Recorder website of the London Air Ambulance taking off from the junction of Woodgrange Road and Romford Road today. I waived my usual fee* in exchange for a credit - hey, today was my last day at work and I was in a good mood! * yeah, as if I'm likely to have a 'usual fee'! (d) use, or authorise the use of, reasonable force for the purpose of taking action under this subsection. Pretty damn draconian, don't you think? 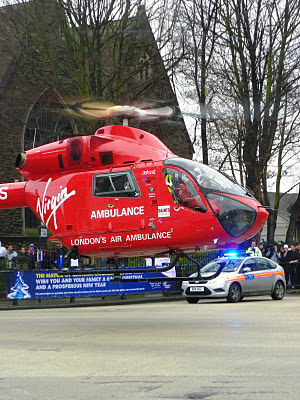 But also a definite 'red rag to a bull' for stubborn east Londoners, despite the threat that conviction can lead to to "a fine not exceeding £20,000". Anyway, thanks to great idea by Luther, today I'm launching a decidedly unofficial "Anti-Olympics Poster Competition". Design the ideal poster for us locals to put up in our windows so we can see whether we get a visit from a "a constable or enforcement officer". Send one entry per person please (in PDF, JPEG or TIFF format) to copwatcher [at] gmail.com by 31 January 2012. I'll display the best entries (along with downloadable PDFs) on this blog. So What Do We Do About Fortress Wanstead Flats? After much debate about how to follow the court decision to refuse to listen to the case for a judicial review, the Save Wanstead Flats campaign is inviting local residents to a meeting at Durning Hall Community Centre in Forest Gate on Wednesday 18 January at 7pm. This meeting offers an opportunity to discuss what to do next, which inevitably covers a broad range of concerns. For instance, there are the question of how to prevent the use of the Flats as a 'security exclusion zone' in the future (for the World Athletics Championships in 2017, for example) and what, if anything, can be done to strengthen the Epping Forest Act 1876, which has been severely undermined by the Legislative Reform Order and the City of London Corporation's cowardice. 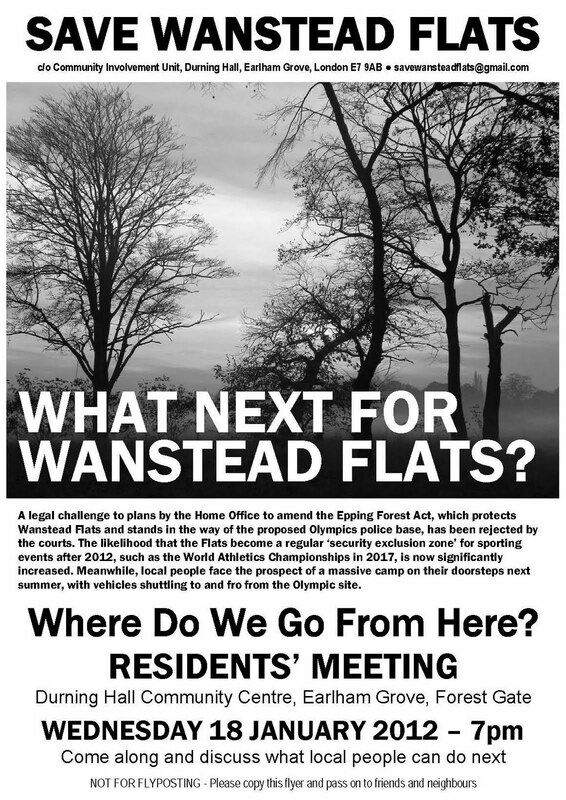 There is also a discussion that must be had about what other steps might still be taken by the Save Wanstead Flats Campaign to try and stop the Met police’s plans - or whether it is time for the campaign to call it a day and let others take over. One way or another, Fortress Wanstead Flats will demand our attention next summer. And you never know - perhaps someone has a creative and imaginitive way that we can still stop it. 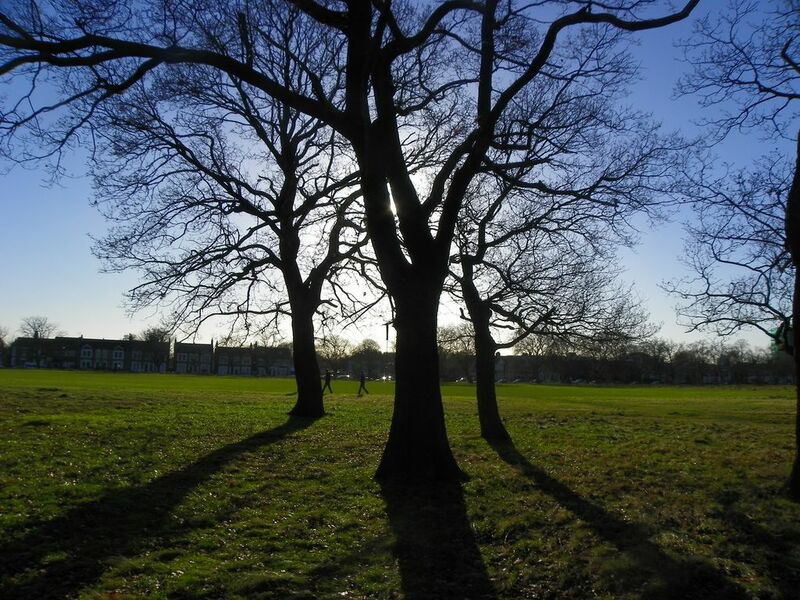 What Next For Wanstead Flats? Let your friends and neighbours know - publicise the event on Facebook or download a flyer and distribute widely. "Eye 1301 reported on how Newham, London's 'Olympic' borough, plans to close the Atherton leisure centre - the only public sports facility of its kind in the 'Olympic zone'. Newham's mayor, "Sir" Robin Wales, says the Atherton has to go because the council can't afford the £2.2m required to run it for the next ten years. Wales has promised a new "state-of-the-art" pool and sports centre, but no funds have been earmarked. Campaigners who want to keep the pool open have discovered that Sir Robin hasn't done his sums properly. Back in 199 the council obtained a £2.36m grant from Sport England to refurbish the centre. One of the conditions of the funding was that the council had to keep it open for at least 21 years - ie until 2020. if not it would be liable to repay some or all of the £2.36m... over £100,000 more than it would "save" by closure. Brilliant!" This information came from a Freedom of Information request made to Sport England by the Save Atherton Leisure Centre Campaign - see this press release. The Council was the beneficiary of a £2.3m Lottery grant via Sport England in relation to the Atherton Centre. The grant agreement allows for Sport England to claw the funding back should the service no longer be provided. However, Sport England have been involved in early development of facility options and remain committed to working with Newham to secure long term sustainable investment in leisure. Sport England have confirmed that their priority is to secure this and welcome the Mayor’s comments about reproviding a new leisure centre. They are not currently intending to seek repayment of any lottery grant although this remains an option. Officers will continue to liaise with Sport England to mitigate this risk. It is now either very late at night or very early in the morning, but I need to bang this out if I'm going to get any sleep. The campaign against the use of Wanstead Flats during next year's Olympics by the police for a Muster Briefing and Deployment Centre has never just been about what happens in 2012. From the beginning, it has always been about the precedent set by choosing to enclose part of Epping Forest, an area supposedly protected by a 135-year-old Act of Parliament. Yesterday's terrible judicial decision, by Mrs Justice Dobbs at the Royal Courts of Justice, meant that leave was refused for the presentation of the case for overturning the Home Secretary's order, which sets aside, albeit temporarily, the protection of the Epping Forest Act 1876. That judgment significantly increases the risk that parts of Wanstead Flats may be 'temporarily' enclosed again and again in the future, whenever it is deemed convenient or necessary. Take, as an example, the World Athletics Championship that will be held in London in 2017. The likelihood that the interests of security will demand another Metropolitan Police Muster Briefing and Deployment Centre are high - the Met described such centres as an important tactic in their court submissions. Where better to site it then, from the police's point of view, than Wanstead Flats? Yesterday's decision clears the way for another half-hearted 'consultation' and the use of the Legislative and Regulatory Reform Act to once again sweep away the legal protections afforded to the Flats. It doesn't matter the Home Office's own preparation was screwed up the first time they tried, or that this piece of highly contentious legislation has only, up until now, been used for minor, almost trivial 'tidying up' of existing laws: the judge decided yesterday that strong public objections are not covered by ministerial pledges to avoid the use of such sweeping powers for 'highly controversial' issues. In future, government departments will be able to change primary legalisation using a legislative order, with little debate in the House of Commons or House of Lords, as long as the majority of an obscure parliamentary committee, voting on party lines (as they did this spring), deem the decision uncontroversial. We, the public, have little say in the matter and no grounds to object. Then, of course, there is the precedent set by the planning decision of Redbridge council. It too doesn't matter that Newham and Waltham Forest councils objected to the planned Olympics police base, or that more than 1800 signatures we collected in opposition, or than the planning committee in Redbridge told people that potential alternative sites were outside its remit. The decision was taken, with little apparent consideration of the objections, and the damage has been done. After next year, Wanstead Flats effectively becomes a useful 'security zone' whenever another major sporting event - held in the next borough at a staggeringly expensive arena that needs to recoup its costs and justify its existence - makes policing considerations a necessity. Almost every weekend, I tend to end up walking on the Flats. All of my friends who live locally say it's one of the places that they love most about living in Newham - one of the few places, in many instances. Had it not been for the fact that I work in Forest Gate and was the first person approached in June 2010 by residents concerned about the police's plans, it may have been months before I found out that a place we love, an open space intended for our leisure and recreation, would be partially closed off during the Olympics. I can say this because I don't live on one of the streets closest to the Flats, where the limited publicity by the police was allegedly distributed, but a mile away. I wonder how many people found out about the plans very late in the day: how many people missed the leaflets put out by the police, or even by the Save Wanstead Flats Campaign because it only had a budget of £180 in donations. I wonder how many people tried to make sense of what they could and couldn't include in a planning objection, or struggled to decypher and understand the laughable consultation document published by Home Secretary on her Legislative Reform Order. I wonder how many people even knew where to find it. Those who expected, perhaps more than I have, that the courts exist to balance the rights of ordinary citizens against powerful state interests have given an important lesson - that they may have been hoping for too much from the judiciary. After all, it took the active support of the City of London Corporation in the 1870s and in 1946 when the Flats were under threat, instead of the tacit, shameful endorsement of the 'Conservators' in 2010-11, to prevent enclosure. This time, the Corporation took the money offered to them and residents were left to fight alone. Back in 1871, history reminds us that it also took huge demonstrations on the Flats to stop the plans of powerful interests, with protests that demolished illegally erected fencing. Sadly, such passionate resistance is probably now a thing of the past, the product of a different age - and as Mark Twain once said: "there was but one solitary thing about the past worth remembering, and that was the fact that it is past and can't be restored." Nevertheless, I must confess that, should I find myself wandering on Wanstead Flats this weekend, I know I'll hope that Twain, a satirist and writer who was right about so many things, was wrong about the past. Hope is always something worth hanging on to. 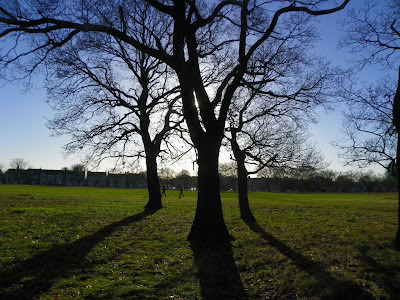 Wanstead Flats: When Is An Undertaking Not An Undertaking? Tomorrow morning, at 10.30am in court 19 at the Royal Courts of Justice, Mrs Justice Dobbs will preside over the the final hearing of a judicial review on the Metropolitan police's Olympic operations base on Wanstead Flats. The court case continues to be a real David versus Goliath affair, with Forest Gate resident Dr Michael Pelling acting as a 'litigant in person' against the expensive legal teams for the Home Office and the police. Those who have been following this case will know that the Home Office used a Legislative Reform Order (LRO) under the provisions of the Legislative and Regulatory Reform Act (LRRA) to override the specific legal protection afforded to Wanstead Flats by an act of parliament back in 1876. At the time of its introduction in 2006, the LRRA was fiercely criticised for giving arbitrary 'modernising' powers without the proper scrutiny of parliament. The Telegraph reported that even Clifford Chance, the world's largest corporate law firm, briefed its clients that the only red tape the LRRA would remove is "the red tape of Parliamentary scrutiny for primary legislation". I am giving a clear undertaking today that orders will not be used to implement highly controversial reforms, that they will not be forced through in the face of opposition from the Committees of this House and that the Committees’ views of what is appropriate for delivery by order will be final. The Government have also given an undertaking that they will not do anything highly controversial using an order and that an order will not be forced through despite opposition from the relevant parliamentary Committees. (..) the Government have placed on a statutory footing a veto for relevant Committees of either House. That will provide further assurance for those concerned that an order will proceed only if the informed view of the House and another place is satisfied that its outcome is desirable. I can reiterate two key Government undertakings: that the Government will not deliver highly controversial measures by order and that we will not force through orders in the face of opposition from the parliamentary Committees. "The undertakings provided to Parliament are not undertakings to the world at large; rather they are undertakings to Parliament and intended to be enforceable only within Parliamentary processes". Their skeleton argument goes on to suggest that "the mere fact that objections have been raised does not mean that an LRO is highly controversial. There must be something of significance constitutionally regarding the reform proposed". So what, you may ask, is Parliament if not the elected representatives of the world at large? I know that much of the time, the massive disconnection between parliamentarians and the public makes it seem like MPs and Lords are living in a different world, but in theory they still represent us. Right? And when, you may also wonder, is a 'clear undertaking' by the government to resist using powers in controversial circumstances not really an undertaking? As far as the Metropolitan police's lawyers are concerned, when an issue is challenged by members of the public. So much for the government's "localism" rhetoric about local people having a say in decision-making that affects us. As for second statement by the Met's lawyers, it's simply : the LRRA was allegedly designed to 'remove or reduce burdens' - but there is absolutely nothing in it about these burdens needing any constitutional significance. Key to this case is the requirement that Ministers consult widely before making an LRO - and Dr Pelling and the Save Wanstead Flats Campaign argues that the consultation was based misleading, based upon a reading of the Epping Forest Act that even the Home Office admits was flawed. What this case has shown is the real dangers of using powerful draconian legislation like the Legislative and Regulatory Reform Act to drive though decisions simply for the sake of convenience - especially when it involves a prestige government project like the staging of the Olympics. If the Met police's arguments are accepted and the state wins this case tomorrow, another precedent may well be set - not only over future misuse of Wanstead Flats, but also that 'clear undertakings' by government are demonstrably no longer worth the paper they are printed on. Over the years and usually over a few drinks, conversation has turned repeatedly to a reoccurring and increasingly tiring topic: are we stuck with Newham's Mayor Sir Robin Wales for ever? For seven years before taking up his current post, Wales was council leader and since 2002, he has presided over a cabinet system in Newham that carries considerable patronage and influence from the top. This has made Wales extraordinarily powerful, because uniquely among the fourteen local authority areas that have directly-elected Mayors, there is no political opposition - Newham's municipal politics are the Labour Group's internal politics. The other more significant problem with the 2000 Act, especially for those of us who believe the mayoral system places far too much power in one individual's hands, was its lack of a mechanism for undoing the referendum that created the post of Mayor back in January 2002, on a meagre 26% turn-out. However, I am indebted to Forest Gate resident Kevin Mansell for pointing out that this is no longer the case. Under the Localism Act 2011, which fulfilled the Coalition Agreement pledge to "allow Councils to return to the committee system, should they wish to", it is now possible to hold another referendum if a council's current model of governance was itself the subject of a vote. Local authorities can do so by a resolution of the full council, which in this borough is never going to happened. But the new law also says that a referendum can be triggered if a petition signed by 5% of the electorate is submitted to the council. In 2010, there were 195,058 people on the electoral register. That means a petition would require 9753 signatures. At the last local election, all the opposition parties were committed to a new referendum and 30,446 electors voted against Sir Robin. Finding less than a third of them to sign up to a call for a new vote should not be an insurmountable task. That's not the end of the story of course: even if a referendum was triggered, any fledgling 'Bring Back Democracy' campaign in Newham would have to make damn sure that it pulled people out to actually vote against the continuation of a directly-elected Mayor. Even with a broad alliance, including all those who are unhappy about council cuts, that's not such an easy task given the patterns of electorate turn-out in the past. Moreover, if the campaign failed, the Localism Act prevents another challenge for another ten years. But as far as I'm concerned, I don't want to ever hear another grumbled conversation about how vital it is that we are rid of our dictatorial Mayor. If people are really serious, then the means are now available to make it happen if they are willing to put in the hard work.